left to right : Payson Infelise, Andrew Kerr, Phillip Infelise. Andrew Kerr wrote: "Last day of the Santana 20 Nationals on Lake Dillon , 7 races are in the books with two more races today. Three races yesterday in winds between 0 and 19 knots , our team of Payson Infelise, myself and Phillip Infelise on Disaster @ Altitude had a 1st, 3rd, 1st to lead the regatta with 12 points, Frank Keesling and his team are in 2nd with 18 points after posting a 2nd, 1st, 5th and in 3rd is Ron Fish, Glen Hughes and Jac Thomas with i believe 27 points as i have not seen the official scores yet. Some great sailing by teams yesterday - in particular Kevin Dickey and his team on Loose Nuts from Eugene YC who posted a 2nd and 3rd. Forecast today is for winds to be 14 to 28 knots with racing starting at 1PM . 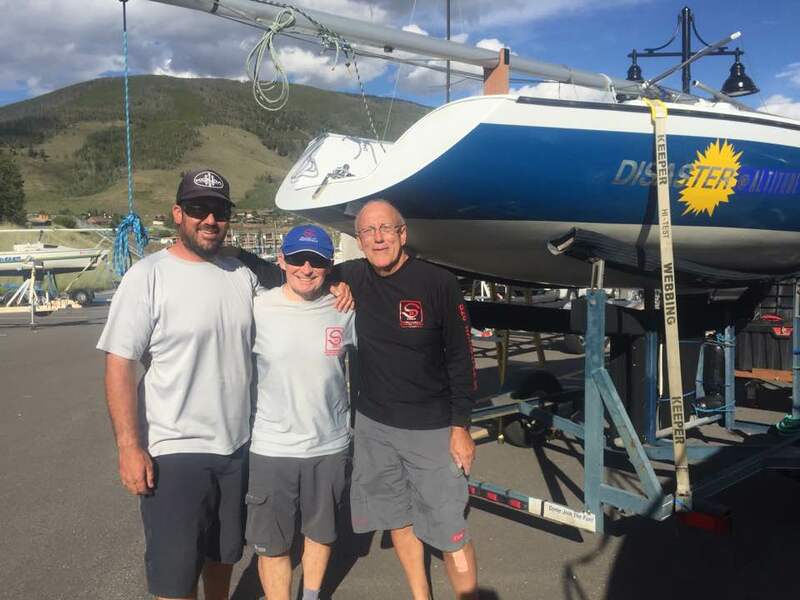 The Dillon Yacht club , the race committee , Mike Mckeever and S20 fleet 28 and all the volunteers have done a terrific job of organizing, running and hosting a great event for the class as we all look forward to this final day of racing ."